"Saving paper is a wonderful alternative to paper accumulation"
Excellent ease with use, great features, when needed, person to person contact has been excellent. I have no complaints! Electronic Tax Forms – No waiting for your tax forms in the mail. You even get your electronic tax form earlier in the month than if you had to wait for the paper version. You can view and print year-end tax forms (including 1098 and 1099-INT) whenever it is convenient for you. Account reconciliation – Allows you to enter outstanding transactions and balance your checkbook. Pie Charts – Shows you how your funds are allocated. Enhanced Check Image Printing – Allows you to print all your check images for the month, front and back, without having to print them individually. eStatement Archive for Statements – Holds one year of history for statements and check images. eStatement Archive for Visa® Bills – Holds one year of history for Visa statements. Printable PDF Statements – Account statements and Visa statements can be downloaded and saved on your computer. Email Notifications – Receive an email message that tells you when your statement is available, and your Visa bill has been posted. Secure – You won't need to be concerned about lost or stolen mail. When you receive your Visa eStatement, to pay your bill we recommend that you use the "Account Transfer" or "Scheduled Transfer" functions in Online Banking. 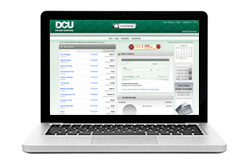 Be sure to make your payments to DCU prior to the due date each month. If you are mailing in your payment, please make your check or money order payable to DCU Visa, include your DCU membership and the Loan Number assigned to your Visa in Online Banking, e.g. ; 141. Do not include your Visa Card number. If you decide that you would like to receive paper statements and you are currently set up for electronic delivery, you must contact DCU at 508.263.6700 or 800.328.8797 to request this change. eStatements is rated 3.5 out of 5 by 11. Rated 5 out of 5 by S@XDA from My Issue with Estatements has been resolved Quickly My issue has been resolved quickly by one of the customer representative ( Denise), She is very helpful and Informative. Rated 5 out of 5 by Sally from Great product and service I am very happy with the overall service I get from DCU. Rated 5 out of 5 by lj from Saving paper is a wonderful alternative to paper accumulation. Excellent ease with use, great features, when needed, person to person contact has been excellent. I have no complaints! Rated 5 out of 5 by SusieQ from This product provides all I need to know about my account use I am able to use my eStatements for a number of purposes. It is a source to quickly track my spending habits, gas use, yearly expenses and more! Rated 5 out of 5 by Puhlady from Nothing could be easier to use and saves trees! Have used for several years and am pleased with all aspects. Rated 4 out of 5 by Kurt from Very helpful towards going paperless, but user interface is tedious When downloading, pdf's have to be selected one month at a time. Would be helpful to have the ability to download a year (or more) ata time. Also, the "Pie" chart report shows on the screen, but isn't inlcuded in the pdf. Rated 1 out of 5 by Angelina from Don’t get this option The estatement won’t be available for you that easy, and if you need a copy they will charge you oer page. The eStatements for the previous month are usually available within Online Banking within the first full week of the month. You should receive a notification that your statement is available before the end of the week. How can I view my e statement? You may view your estatements by logging into Online Banking from our full site and then selecting the ESTATEMENTS tab. How can I access my tax information? I use to receive a document that I could give to my accountant to do my taxes. How do I retrieve this? Your tax documents are available through Online Banking by selecting the ESTATEMENTS tab. If you are not set up for electronic statements a copy would have also been sent to you by mail. I cannot find 1099-INT for 2012 under my estatements. Have 1099-INTs been out yet? 1099-INT forms for 2012 were provided in January 2013. If you do not have one, it is likely because you earned less than $10 in dividends during the tax year. You may confirm this by reviewing your December 2012 Regular Monthly Statement.